Distribution of the game is currently limited to docomo-branded phones via Capcom Party. 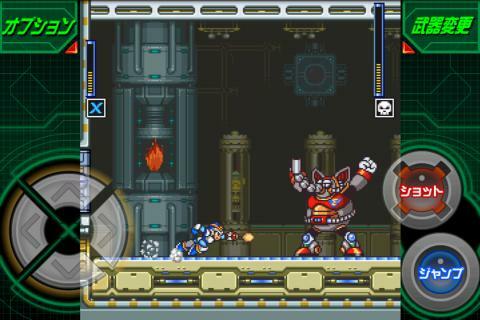 As with most mobile Rockman games, X1 requires a 315 Yen ($3.80) monthly fee. To be perfectly honest, I shudder at the thought of playing X1 with touch-based controls. It's one of those games that pretty much requires force-feedback. Unless gameplay was tweaked to compensate touch-screen input (à la the iOS Mega Man 2 port), I highly doubt this will be an enjoyable port. Throwing your controller in frustration is one thing, but throwing your phone is much worse! Meanwhile, cases of smartphone screen cracking in Japan increases by 400%. Honestly, I can't imagine it being very easy to play a game like this with touch-based controls. i don't support cell phone gaming, since it's flooded with garbage games that don't deserve to be played, and as such, i don't like seeing good games be put on it so that they can say core gamers are just stupid for not going with the popular flow. you won't see the iphone version of SF4 at evo, and even some of the better games that exist on phones are coming to consoles. what's that saying? and now X1, a game that requires at LEAST good reflexes and decent controls is on a system that allows neither. and you can't press the buttons as hard as you normally would, due to it being a touch screen that wasn't built for that kind of gaming. that also hinders your reactions. i know capcom was doing it for money, but really, supporting cell phone gaming is like giving nukes to terrorists. thankfully, nintendo doesn't believe in such crap, only releasing 2 apps to my knowledge, and they aren't even real games at all. 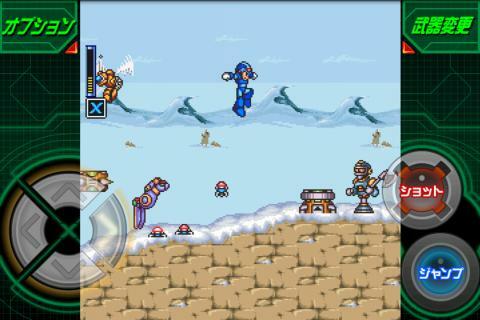 Its cool if X and Rock get into a few fighting games, but I want a NEW MM GAME. Hey, look, an instance of it being good that we don't get something from Capcom here in the states! I know what you mean. When the first X came out back in the day, I actually tried dashing with the d-pad while playing through the whole game. It wasn't fun that way. I've played games with touch screen controls on my android, not one of them I have found to be fun that way either.